Why is the Jewish community crying? I’ve worked with teens in the Jewish community for many years, and feel privileged to work with such a talented group who are in the minority among their peers. In study after study I’ve read about how the ‘younger generation’ is not connecting to the Jewish community. Since silence assumes agreement (Shtika kehodaya dami) I’ve decided to speak—actually write. I’ll define ‘younger generation’ here as those high school junior and seniors who are not enrolled in day school. It is a time in their lives when they’re making decisions about their identity. I’ve gotten to know them and a little bit about their lives. Let’s pretend you’re one of them. Your bar/bat mitzvah was several years ago. Against all odds, you decided to ‘stay the course’ after that and remain in your synagogue’s Confirmation program, though 50% of your friends dropped out. So, let’s say that makes it down to 10. After that, you decided to go for more learning, and enroll in a community Hebrew high school for 11th and 12th grade. About 75% of the 10 decided not to. Now you’re down to about 3. You’re clearly in the minority, swimming upstream as they say. The good news is that by being a part of a larger community school, you now have a whole new peer group, and no longer feel that you’re one of a few, relatively speaking. In what ways have you been involved in the larger Jewish community? You may have been invited by the Jewish Federation to participate in the equivalent of a “Super Sunday”: spending a few hours of cold calling to the most disengaged members of the Jewish community and trying to convince them to donate money. It was not a great experience, but hey, you got to be with some of your friends and eat a bagel. You may have even gotten a T-shirt out of it. You may or may not have been involved in some youth group activities. That could have been iffy. Some chapters good, some not so much. It would have depended on where you live. If you ‘moved up’ in the organization, your leadership would have been focused on the particular movement. You may or may not have gone to a Jewish camp. It’s doubtful that when you returned from camp, enriched by all the amazing Jewish experiences, that you would’ve been called upon to take on any leadership roles in the community, but hey it’s your friends at the camp that matter the most to you right now. Thank goodness you’ll see them at the camp reunion. Maybe you can even work there as a counselor when you’re in college. You may or may not have gone on an Israel trip, though you know that if you did go while in high school, you’d be disqualified from going on a birthright trip in college, while most of your friends who didn’t already go will be entitled to. The above is what has been called “engagement”. And here you are, the ‘cream of the crop’ (among non-day school kids). What experiences have you had (beyond the discrete denominational connections) with the larger Jewish community? In what ways have you been reached out to? In what ways have you been made aware of Jewish communal needs? Interests? Leadership opportunities? Internships? Jobs? You probably will be among the future leaders, simply because the education and involvement you’ve had puts you there. All of the activities you’ve had provided you with wonderful ways of connecting you in some ways with your Jewish heritage. Participating in all of those things are truly beneficial to building Jewish identity. Back to now. Is this all thatwe can do? Are these all the resources we can muster? Is this how we’re modelling engagement? By denomination? Through fundraising? If things were substantially different, we wouldn’t be lamenting and crying so much. The Jewish community will need leaders for the future, no question about it. It’s been called a crisis. I just don’t think we’ve done our part. 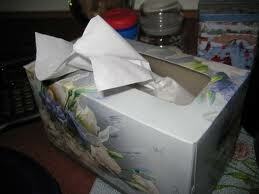 So, no tissues from me. This entry was posted on Tuesday, May 3rd, 2011 at 2:00 AM	and tagged with high school, Jewish camps, Jewish community, Jewish education, Jewish Federation, Jewish parents, Jewish Teens, Teenagers, youth groups and posted in Jewish, Jewish Community, Jewish Education, Jewish Teens, Teens. You can follow any responses to this entry through the RSS 2.0 feed. « Can our students just show us some love?